Some Major Highlights Include: Pax Beale from USA – The oldest competitor ever at 65 years. John Citrone winning consecutive Masters titles. Amazing condition! 34 years in competition! Grant Clemesha winning the first ever overall Amateur Mr. Universe title by an Australian. This year GMV did something special to mark the 25th time we have covered the NABBA Universe on film or video. The first was back in 1970 when the winners were Arnold Schwarzenegger (Professional), Frank Zane (Amateur) and Christine Zane in the women’s event. Held in Birmingham, UK on October 14th, 1995 in the wonderful I.C.C., we had two camera crews covering the 150 competitors and the day’s proceedings. You will see pump room action (men and women), interviews with the top competitors and a 2 camera production at the Evening Show in this 90 minutes of fantastic muscle. See all of the posing routines of the top 6 in each class through to posedowns, OVERALL and awards. Brian Buchanan (ex British competitor – now Australian) making it the men’s double for Australia winning the Professional Universe. Mike King (UK), and Dennis James (USA) – were other class winners. Pax Beale from USA – The oldest competitor ever at 65 years. This is the longest running and most prestigious event in the history of bodybuilding! The line stretches from Grimek and Reeves through Schwarzenegger to Grant Clemesha, Australia’s first ever overall Amateur Men’s winner in 1995. 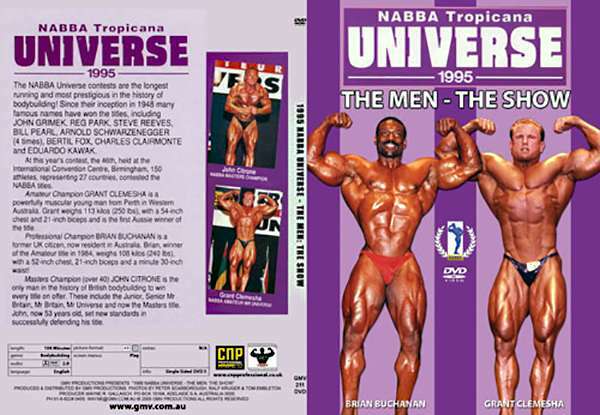 Complete index listing of ALL NABBA UNIVERSE DVDs here.